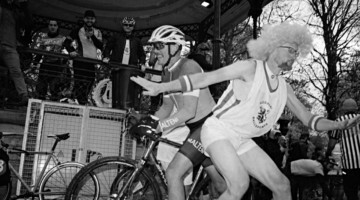 With cyclocross season a month away, some ’crossers might be looking to upgrade their ride for the upcoming season. Our #crossiscoming series continues with a look at the re-designed, race-specific Specialized Crux. 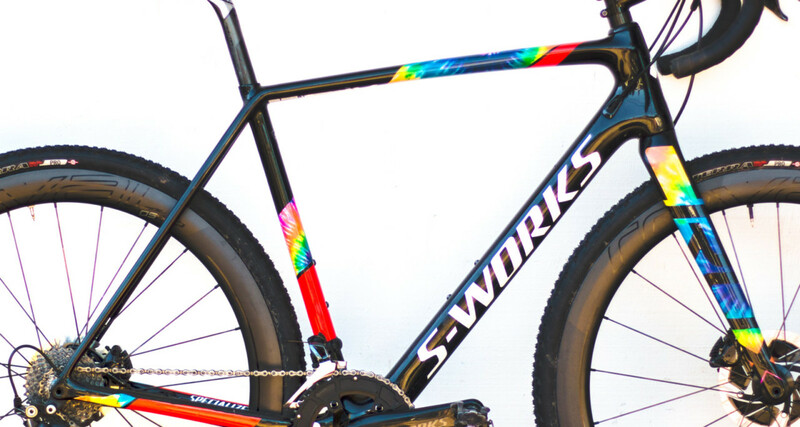 When we first saw the new S-Works CruX under Cody Kaiser at the 2017 Sea Otter Classic, we noted its minimalist, race-oriented design. 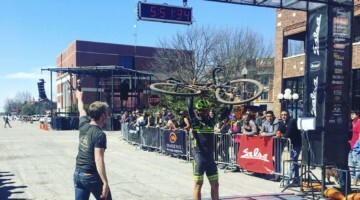 Kaiser teased as much on his Instagram account after the race, noting its light, fast ride, the former of which certainly helped for his cyclocross double dutch antics. 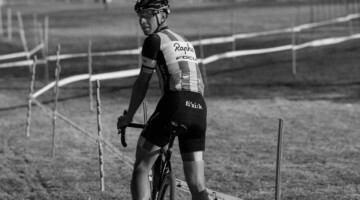 Flash back five years ago and even cyclocross race bikes came with wide tire clearance, mounts for racks and fenders and road-like gearing. 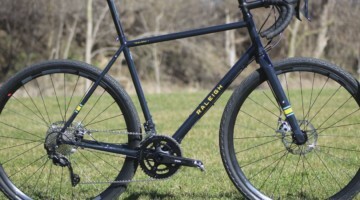 Since then, in part thanks to the popularity of gravel bikes, some bike companies have transitioned toward cyclocross bikes designed just for cyclocross racing—while releasing other models specific to gravel, bikepacking and adventure. 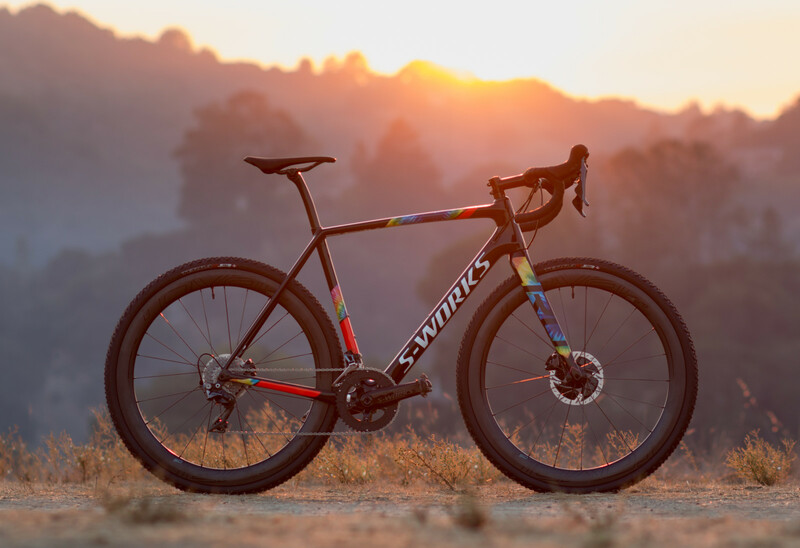 When Specialized updated its CruX cyclocross line last summer, it sought to follow that trend and build the ultimate cyclocross race bike. The new S-Works CruX’s mission is to provide a lightweight bike for whipping through corners, shedding mud and maybe hopping some stairs or barriers. 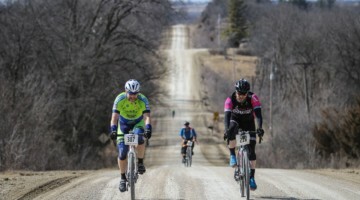 Gravel, bikepackers and adventure seekers? You were not the target audience for the new CruX. Last cyclocross season, we hopped on the flagship S-Works model to see if the big S succeeded in its mission, and today we’ve got our detailed review. Looking for an upgrade before cyclocross season? 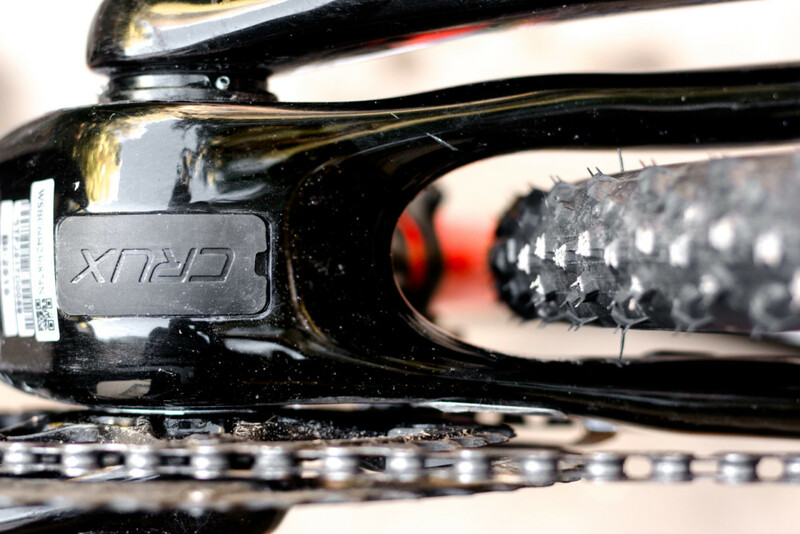 See if the new CruX is right for you. 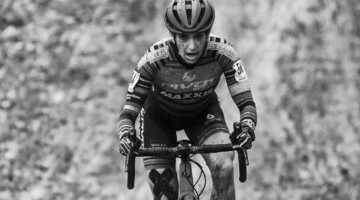 The CruX as a platform has been around since 2010 when it replaced the Tricross as Specialized’s cyclocross bike. Last year, Specialized redid its frames. 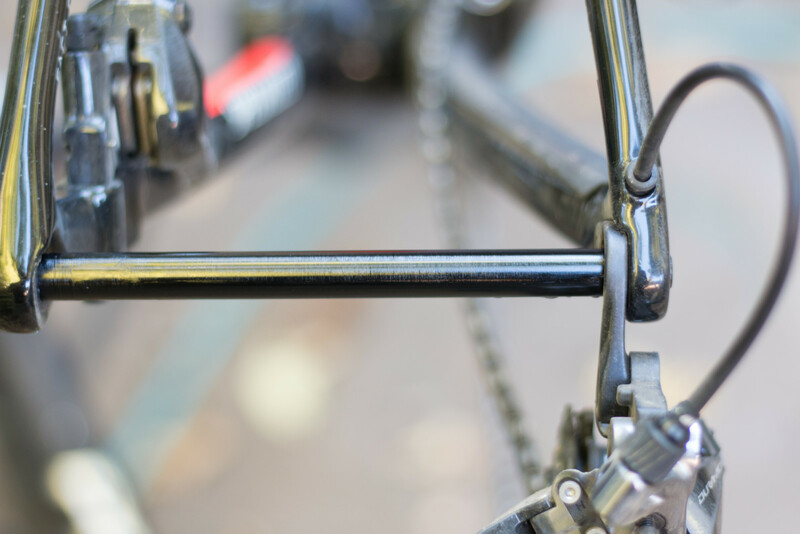 The carbon frames shed grams, and embraced modern standards of flat mount and 12mm thru-axles. Long gone is the proprietary SCS (Short Chainstay System) 135mm thru axle that caused so much confusion. 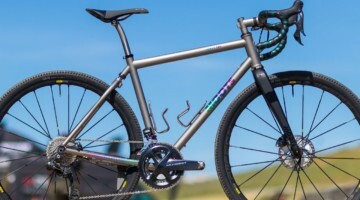 The company put the CruX on a diet and gave it a geometry tweak to make it longer. Our 56cm test bike gained 4mm in top tube length while keeping the same seat and head angles, and added another 1mm in fork rake. The bottom bracket drop and chainstay length remained the same as the previous iteration, at 69mm and 42.5cm, respectively. With a 72° head angle (paired with a 73.25° seat angle), Specialized has resisted the trend to mountain bike-ify its drop bar dirt bike with a slack head tube, as brands like Cannondale (with its updated SuperX) and Kona have done (with its revamped Major and Super Jake). The 2018 colors are certainly eye-catching. 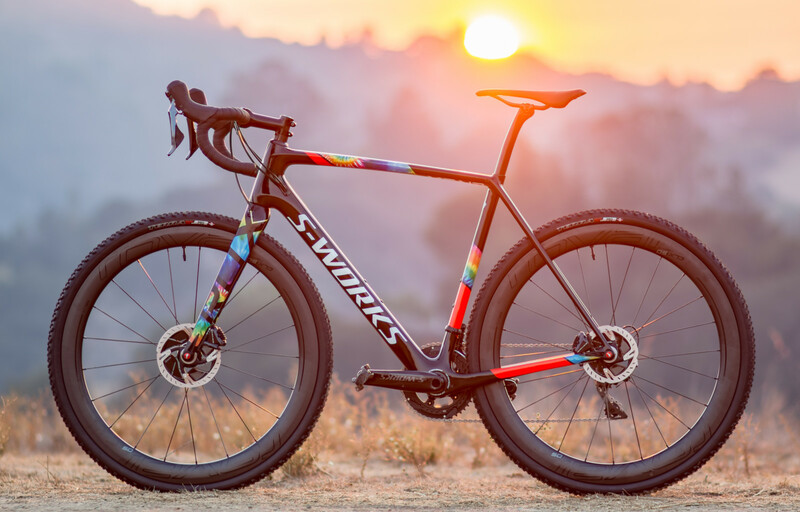 The $7,500 top shelf S-Works model featured what Specialized calls internally “hippie camo” with a tie-dye and fluorescent orange scheme (officially it’s called Gloss SL Black/Cosmos/Rocket Red/White), while the $4,200 SRAM Force 1 CruX Expert X1 swapped tie-dye for a fluorescent fade or a “Rocket Red” with Neon Blue and Cyan. The $3,200 Elite with Rival and $2,800 Sport with Shimano 105 feature the carbon 11r frame with more subdued colors. Although we haven’t ridden them, the two most affordable models look like great values. Curiously, the S-Works frameset retails for $2,800 as well and trades a full 105 build kit for an S-Works seat post. That’s a pricey post. The top-level S-Works model is still made of FACT 11r carbon, but now the non-S-Works models also use the same carbon, despite some early models coming with the wrong 10r carbon labels. 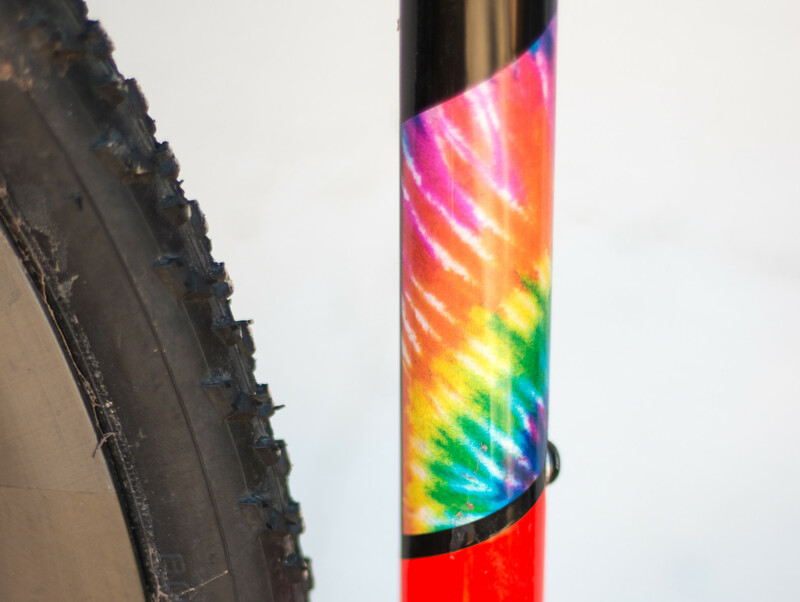 The fork continues to use a 1 3/8” tapered steerer tube. 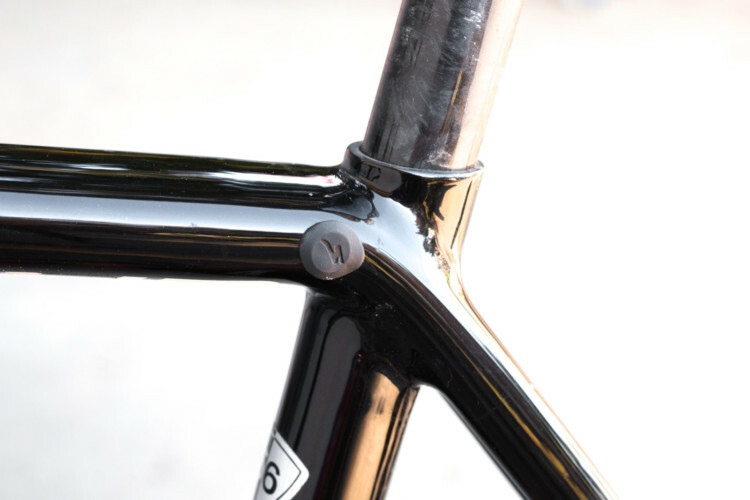 Most obvious when compared to the earlier SL4-era frameset is the removal of the seatpost collar. 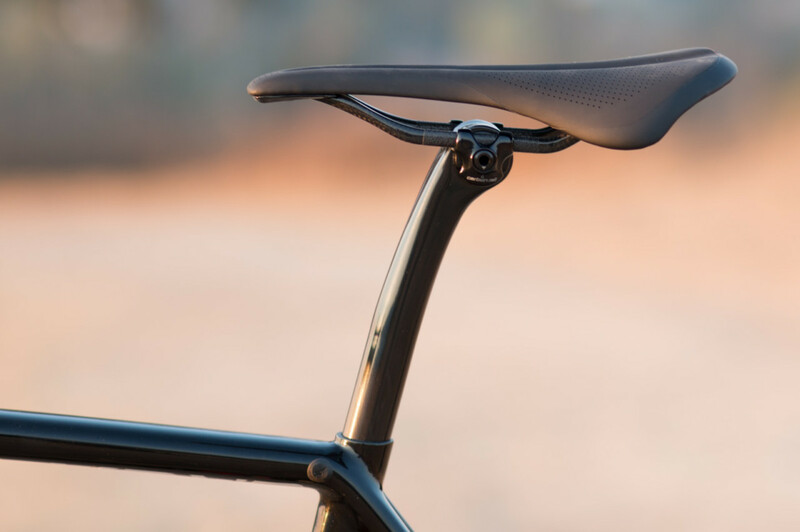 By using the internal wedge first developed for the Tarmac road platform, the seat post can flex more, which increases the post’s compliance on bumps when the rider is seated. 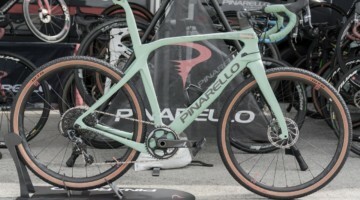 The frame, which weighs a claimed 300g less than the previous S-Works model, should be one of the lighter production cyclocross frames available, but did not skimp on features. It comes with internal cable routing with a series of interchangeable port covers, which add or subtract cable ports depending on the setup of the bike. There is also easy access to the shift and brake housing and hoses down by the bottom bracket thanks to a CruX-branded cover. As we mentioned, the new CruX has embraced the most popular standards, including flat mount disc brakes and 12x100mm and 12x142mm thru-axles front and rear. Additionally, the frame was designed to shed mud better, with a more sculpted fork, removal of the seat stay bridge and, on the S-Works model, hydrophobic paint. 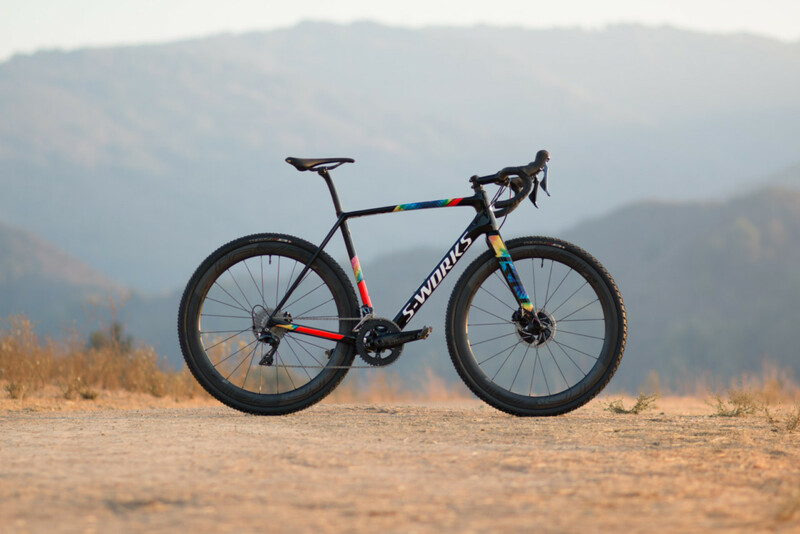 While Specialized makes it clear the bike was not designed to be a gravel bike or a do-it-all bike—it touts tire clearance for only up to 38mm tires—there’s likely room for your favorite 40mm gravel tire. We fit a 44mm tire (the excellent WTB Resolute 42 on a 26.6mm internal width Alto Cycling AMX29 alloy rim) out back, but any bit of mud or wobble in the wheel would have us scraping paint off the chainstays. However, a true 40mm wide tire should clear just fine without issue in most riding conditions. 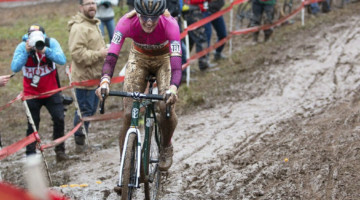 For cyclocross racers, this all means good mud clearance and the ability to run some fatter rubber like the new 38mm Tracer and Terra tubeless tires, the existing 38mm Trigger tubeless tire or the staff favorite, the versatile 38mm Ritchey Megabite. 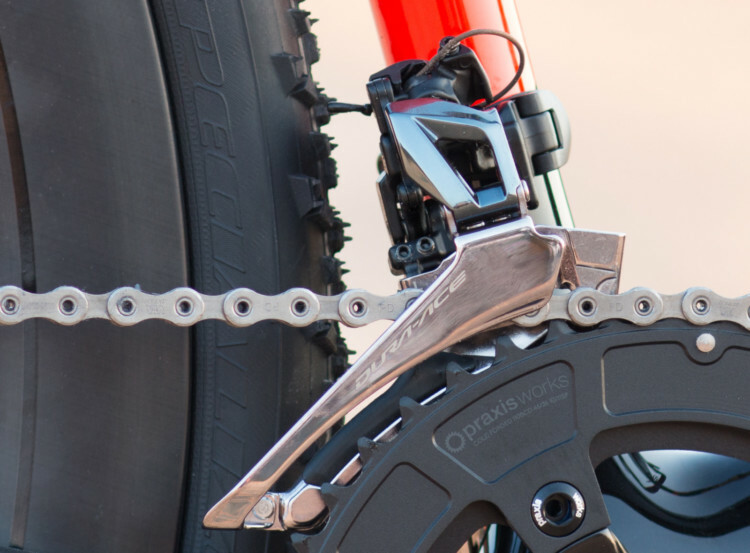 Specialized removed the front derailleur mount, but the round seat tube accepts clamp on derailleurs. Specialized added a third set of bottle mounts to the CruX for 2017, but this “gravel” feature is absent on the new model. If you’re going to spring for what you hope is the ultimate cyclocross racing frame, you’ll probably expect the ultimate cyclocross build, right? Specialized spares little expense in decking out the S-Works model, with Shimano Dura-Ace 9100 componentry, carbon Roval CLX 50 wheels and a carbon cockpit. Each component is top-end and contributes to the lightweight build, but the real question is, are they the best choice for cyclocross? The complete S-Works build comes with mechanical Dura-Ace R9120 shift/brake levers and hydraulic disc brakes. 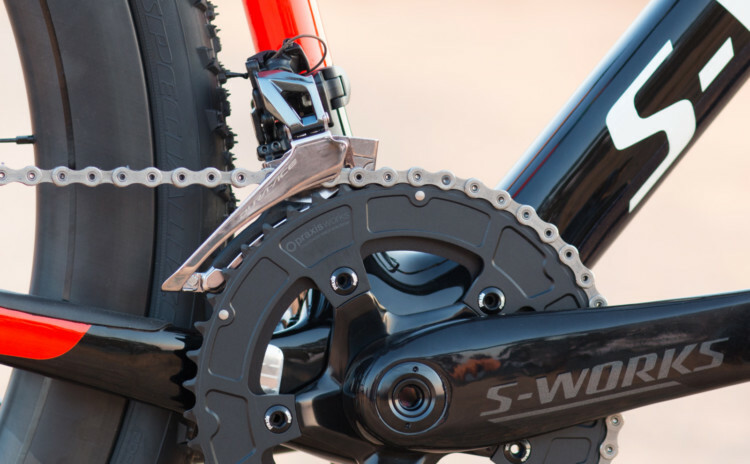 The Shadow rear derailleur keeps a low profile and should reduce bent hangers during spills. The updated front derailleur requires re-learning your adjustment routine, but the design doesn’t rub on big tires and shifts like a champ. The CruX S-Works comes with its namesake crankset with CeramicSpeed BB30 bearings, Praxis 46/36t chain rings and an 11-30t Dura-Ace cassette. No, it’s not Di2, but the sum of the parts shifts almost as effortlessly. The S-Works model includes Specialized’s own WinTunnel-engineered Roval CLX 50 wheels, which also feature bearings from CeramicSpeed and DT Swiss 240 hub internals. The 50mm carbon rims are tubeless ready and feature 2:1 spoke lacing. The 1,415g (claimed) wheelset is relatively light and boasts wind-cheating properties. 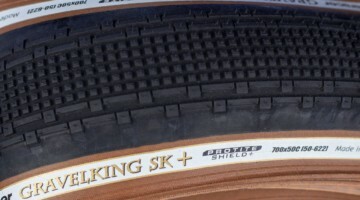 Specialized claims it works with high (road) and low-pressure tubeless tires. 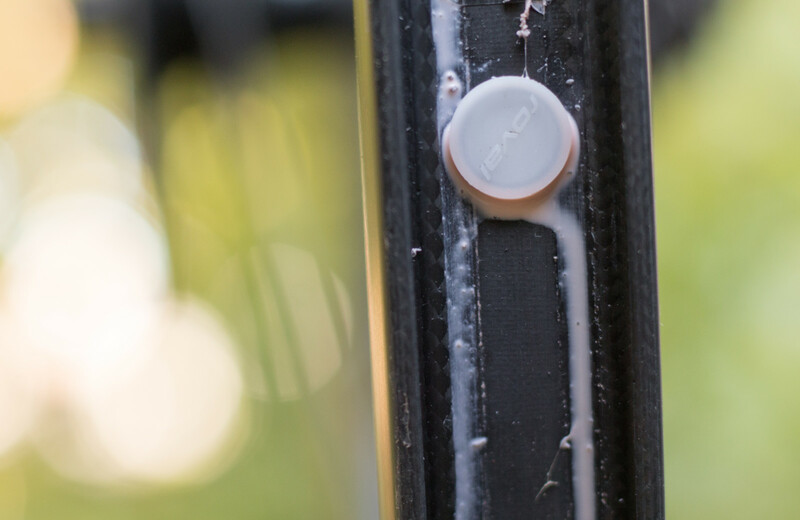 The conventionally drilled rim eschews tubeless convention in that it relies on plastic plugs to seal the rim bed. 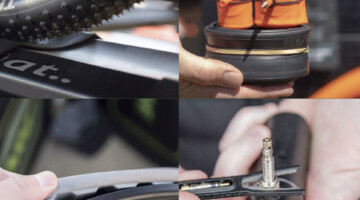 Specialized claims better tubeless performance and weight savings over tape. More on that in a bit. 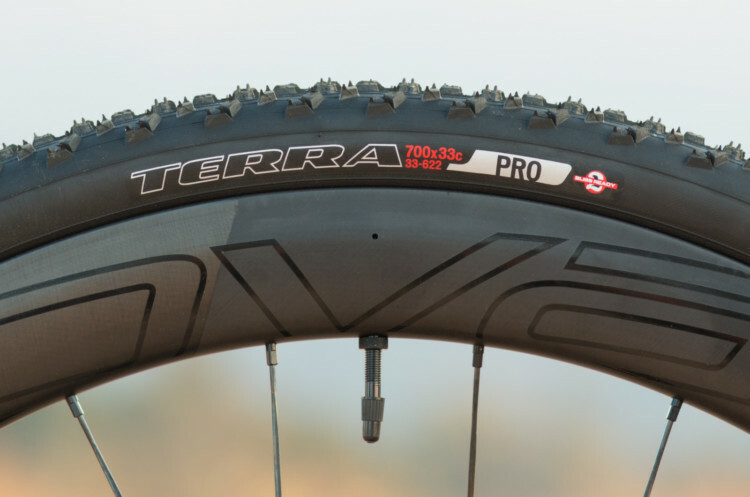 Specialized provides the tires as well, shipping the bike with the outgoing version of their tubeless ready Terra mud tire that we previously voted best tubeless clincher. We suspect the 2019 models to feature the newer Terra tread. Specialized also provides the cockpit. 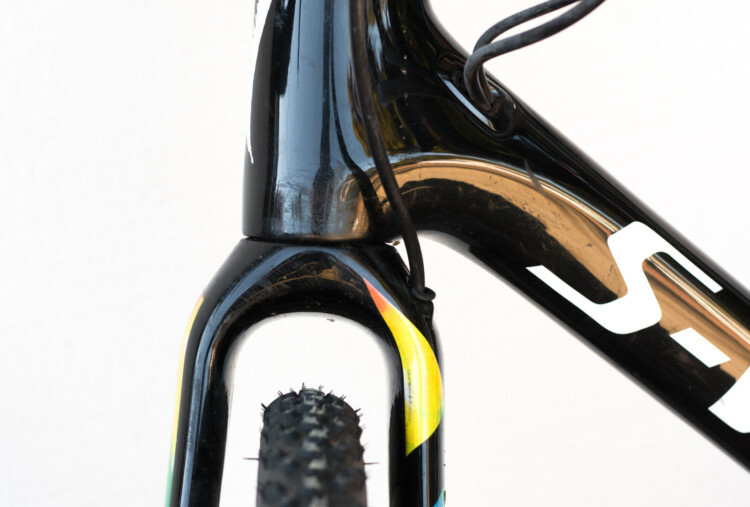 It pairs a carbon-railed S-Works Phenom to an elegant S-Works seat post with 20mm setback. 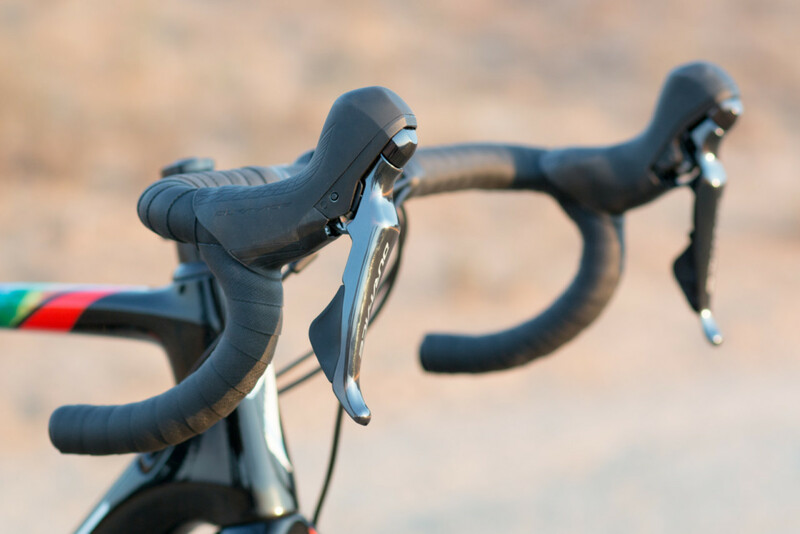 Up front, the S-Works Carbon Shallow Drop handlebar with an S-Works aluminum stem with titanium hardware offers up lightweight, gram-saving controls. If you’ve waited this long, we won’t keep you shivering at the line any longer. Simply put, Specialized’s new CruX carbon frame is a winner. 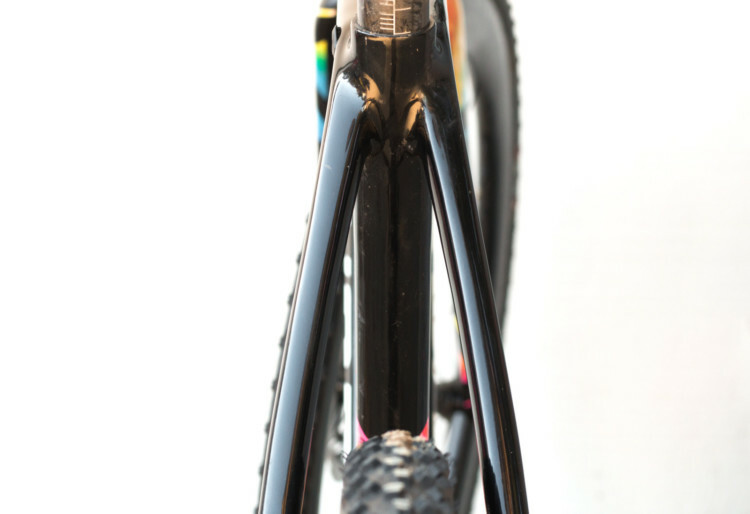 You’d be hard-pressed to find a better dedicated cyclocross race frameset. The race-oriented, slightly long top tube with moderately steep head angle and 69mm bottom bracket drop team up to help you navigate fast, dry courses with confidence; the generous tire clearance keeps you rolling through the thickest mud; and the 42.5cm chainstays help you in your attempts to ride the run-ups. When you inevitably fail and have to dismount, it’s not too far to the ground, and it’s almost a joy to throw on your shoulder thanks to the weight-weenie-friendly build and slimmed-down frameset. 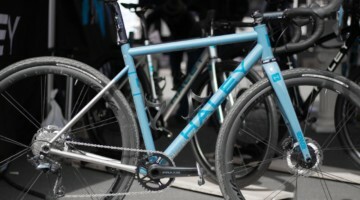 Geometry wonks would be hard pressed to find major fault with the new CruX for cyclocross racing. 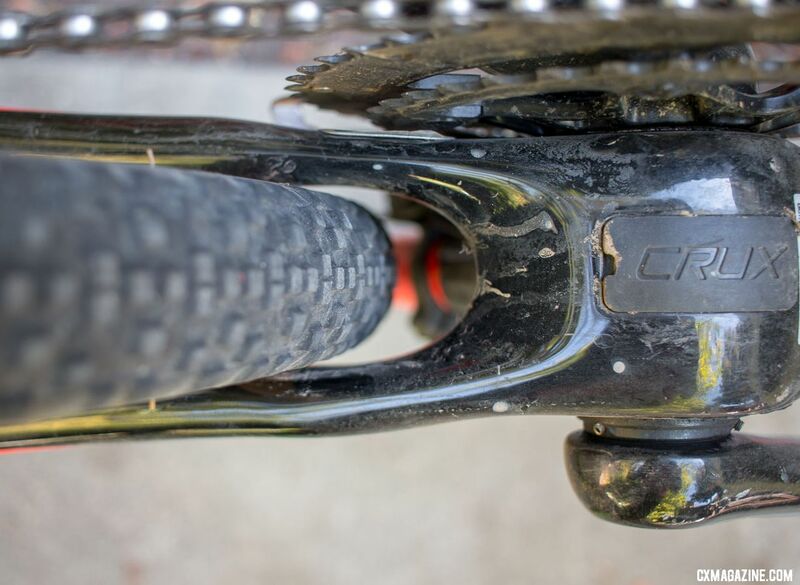 Sure, it doesn’t feature Euro old school, sky-high bottom bracket drop of 5cm or less, nor does it feature the slack head angle and 55mm rake of Cannondale’s OutFront geometry, but we find for typical American cyclocross racing, it’s in the sweet spot. The S-Works model, especially with its double crankset and Roval CLX 50 wheels, is also well-suited for fast pavement-centered group rides. Maybe you won’t carve the tightest hairpins in a crit with your longer-than-road-bike configuration, but you’ll feel right at ease sucking wheels, especially when the pavement needs a bit of maintenance and you’re enjoying high-volume rubber. Speaking of high-volume rubber, the tire clearance is decent for an OSBB/BB30 frame. We’ve fit 40mm tires without issue, and enjoyed sufficient clearance around cyclocross tires out back, and especially up front. Specialized has been loyal to its OSBB “standard,” but now that it also has threaded BSA and BB386 EVO bikes, we can’t help but wonder if the company could have reached best-in-class tire clearance with the same short chainstays by opting for a wider 86mm shell. 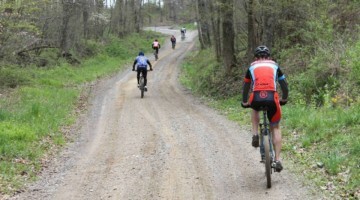 Find yourself sprinting for a cyclocross win or town line? The updated CruX delivers a snappy, stiff ride. Despite the 300g weight savings, the bike continues to offer an efficient, acceleration-happy ride and relies on the longer exposed carbon post to flex for comfort. It’s not quite the flex of the Schwinn Vantage RX, or even the Trek Boone, but it’s also simpler with no moving parts, bearings or elastomers. While the frameset did nothing but impress us, the build failed to live up to its S-Works name and intention. Let’s start with the positive. It’s certainly not the drivetrain’s fault. The Shimano Dura-Ace 9100 group impressed with its shifting and braking prowess and left us believing at times we were riding Di2. The Praxis rings paired nicely with the new Dura-Ace front derailleur, and surprisingly, we only dropped a chain once despite riding without a clutch or chain watcher. 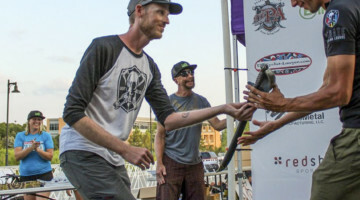 Up front, the Specialized carbon bar, stem and even the grippy, cushy tape delivered comfort and control in all conditions, whether that was in dry or wet, for 45 minutes or multiple hours. It’s out back where we found faults. The S-Works FACT carbon seat post raised our eyebrows with its elegant design and one-bolt clamp, but it raised voices after failing to hold its angle after remounts and hitting big bumps in cyclocross races. 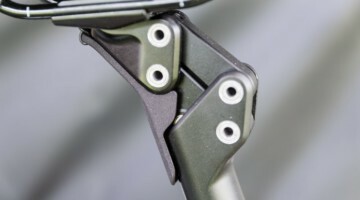 Clamping the carbon rail saddle exactly to torque specs, or as suggested by Specialized, over the written limit, failed to keep the angle in place. Specialized sent a Ti rail saddle and new clamp as a replacement, but after two pit stops in races, we held fast to our seat post rule: “Two bolts, front and rear, never fear.” We swapped the problematic post for a 234g Vision SB20 Metron post, and thankfully never looked back, or up, since. It’s worth noting the stair-hopping U23 champ Blevins did not appear to have such seat post issues. As for the wheels, we’ll preface this by saying we haven’t yet seen a production cyclocross bike come with carbon clinchers that we’ve thought were up to the task and worth the premium. 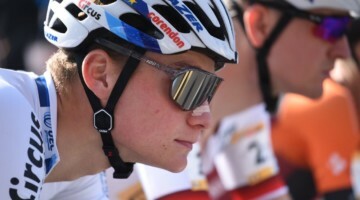 Unfortunately, the S-Works CruX continues this trend. Some will love these wheels, others will end up replacing them on race day for tubulars, and tubeless racers may crave something more burp-proof and even lighter or wider like the Roval Control SL 29. The Roval CLX 50 wheels, at $2,400 retail by themselves, offer lightweight, aerodynamic bling and are perfectly suited for dual duty as road disc wheels. They make the S-Works build attractive if you intend to use the CruX also as your road racing machine or swap the wheels over to your road disc bike. They’re quite light for their depth, and have remained round and true. 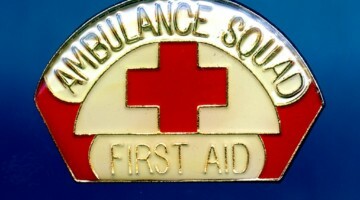 However, they may fail as equipped to meet the needs of serious cyclocross racers. Early rides turned sidewall impacts into small burps at low tire pressures. After a few weeks, the sealant effectively “glued” the bead down for more reliable low-pressure riding, but other problems emerged. A few too many goatheads revealed a concerning flaw in the CLX 50’s bead and bed shape. After a major air pressure loss, the tire’s bead fell into the center channel, making all attempts of airing back up with a mini pump hopeless. There’s no barb or uphill slope to keep the tire’s bead in place, and only an inner tube offered hope of making it home (CO2, if available, might have worked, but it took a few blasts of a tubeless pump back at home to reseat the Terra clincher). Tighter fitting road tires or ultra-tight cyclocross tires like the WTB Cross Boss might prevent such issues, but our experience highlights the fact that these wheels are better suited for their primary purpose: high-pressure road cycling. Another issue that might be a bit deflating is the Roval rim plugs. Specialized claims the O-ring-equipped plastic plugs save over 30g per wheel, which seems substantial. 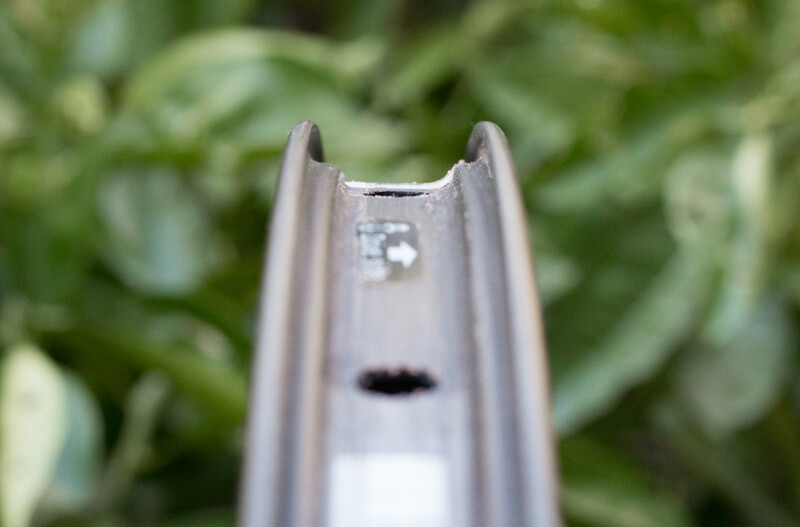 While that might be true compared to the heaviest rim strip, compared to a layer of tubeless tape, we estimate the plugs save a mere 12g for the full wheelset. The plugs certainly won’t get damaged by a tire lever out on the trail, but seem to offer more points of failure in terms of air leakage, while the thickness of a layer or two of tape helps turn a loose-fitting tire into a more secure setup. After removing the plugs, we saw a bit of sealant inside the rim’s cavity—confirming an installation or design issue. We’ll opt for tape here. Specialized aced its first test of building a race-ready, title-chasing cyclocross frameset. You’d be hard pressed to find a better racing platform. Our test bike, the S-Works CruX was produced in limited quantities, and its $7,500 price and questionable seat post and wheel choices put it out of reach of many. The carbon Expert, Elite and Sport CruX models look to be better values while delivering the same superb platform. All three eschew the pricey, aero Roval CLX 50 wheels, while the Elite and Sport both swap the angle-slipping S-Works FACT carbon post for more reliable two-bolt alloy options. Thankfully, Specialized uses the same carbon and geometry for its more affordable and more subdued Carbon models, and looking over those specs, it’s worth rushing to your local store to see if it has 2018 models in stock before the 2019 models are announced and released. CrossIsComing, and you’d certainly be ready for it with a carbon CruX. See a full photo gallery below the specs. Andrew Yee, Brandon Grant and Zachary Schuster contributed to this review. I cannot begin to commend you enough on the bottom bracket underside pictures. 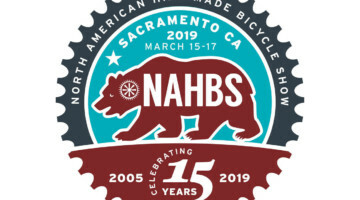 Knowing actual tire clearance (bonus for a 2nd set of tires and rim measurements included ) and how the cables are routed (no more exposed bare cable running under off-road bikes!) are very important and often missing from anybody else’s reviews.